Breakfast is a civilised affair - Italian pastries, cereals, juices and most importantly, real coffee! Satisfied, I'm off to explore again. 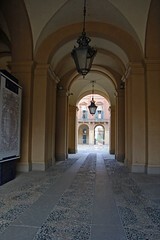 Armed with a map and a questionable sense of direction I begin my trek to find the Palazzo Reale. 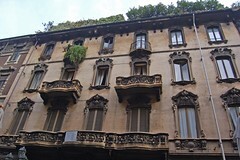 It's a relaxed walk down the Via Garibaldi (one of the pedestrian only streets) as I take in the surrounds, stopping often to take photos. 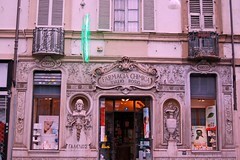 This pharmacy was opened in 1804 and still has all the original fittings! 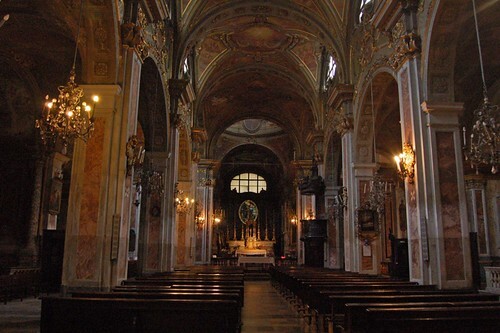 I'm particularly taken by the different styles of churches - this is San Dalmazzo. 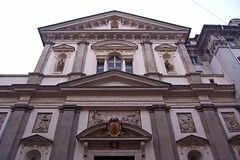 It's situated next to the ex-convent of the Barnabiti and it's known for it's elegant 17th century facade. 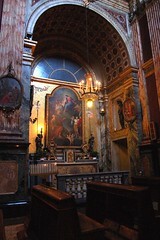 This is the Chiesa di Santissimi Martiri - Church of Most Holy Martyrs. 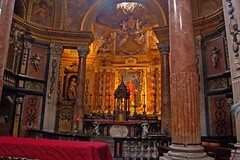 Founded by the Jesuit Priests in 1577 it's main attraction is it's altar designed by Juvarra. 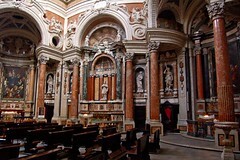 I spend a while here trying to find the Cappella della Pia Congregazione del Banchieri e dei Mercanti (Chapel of the Pious Congregation of Merchants and Bankers) but I just couldn't work out where it is. 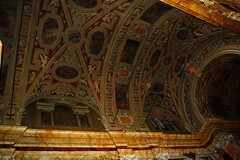 It's a bit disappointing as it's supposed to have some wonderful frescos by Legnanino. 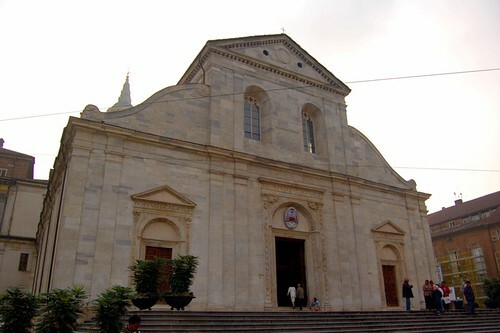 The next church is the Chiesa di San Francesco d'Assisi - the original church dates from the 13th century and it's current form is from 1761 and was designed by Vittore and Quarini. 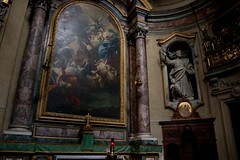 I'm finding that the churches here are a lot darker inside making photography difficult. I have no desire to use flash. 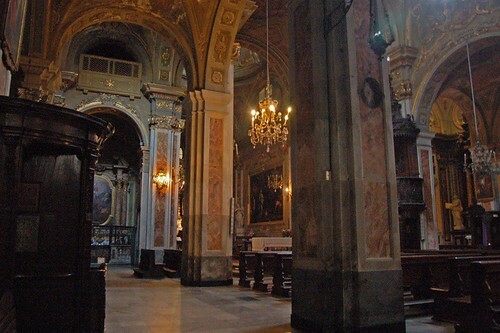 Hopefully even in the dim light you can get an idea of the beauty and elegance of this interior. 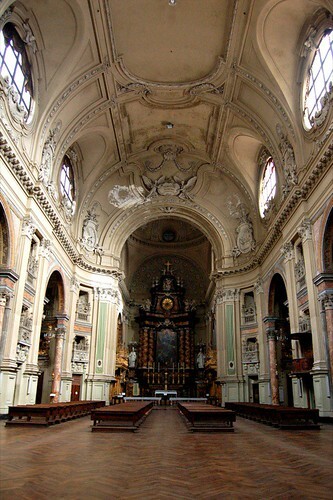 Now we arrive to one of the oldest churches in Torino - the Chiesa di San Tommaso. 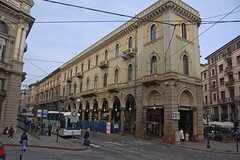 It was rebuilt in 1584 and then radically redesigned at the end of the 19th century by Carlo Ceppi. 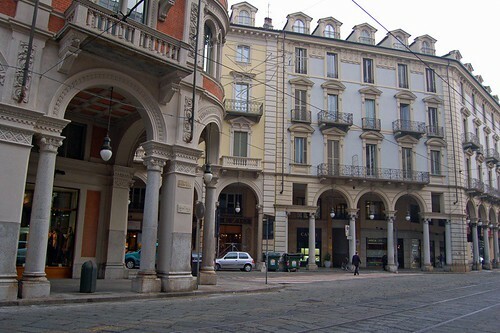 There's one thing you'll see a lot of in Torino and that's the covered footpaths. There's a difference in their structure depending on which side of the road they are on - in some places you'll notice that the verandas also cover roads and this is because that side was used by the royal family only - so, when the court went for a stroll it wouldn't matter what the weather was like, they could walk totally undercover. 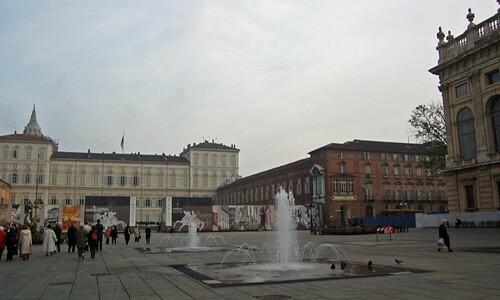 How fitting that I end up at the Piazza Castello - home to the Palazzo Reale and the Palazzo Madama. You might be able to tell by the fence across the front of this building that it's closed for renovation. 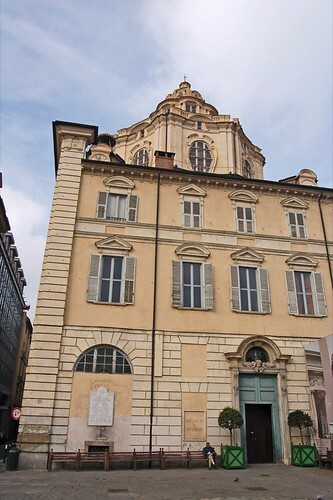 These days it's home to the Museo Civico di Arte Antica (Civic Ancient Art Museum). 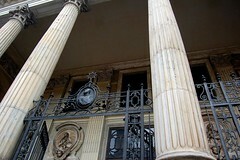 The palace is a bit of a mash of styles - the facade is baroque while other sections date from medieval times. 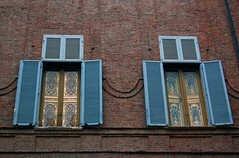 It includes parts of the ancient Roman gate and in the 17th century it became home to the Royal Widow (Madama Reale). 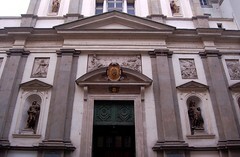 The baroque facade by Juvarra was added in 1721. 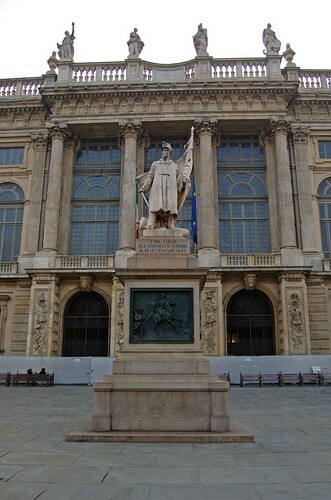 This is the monument of I Milanesi all'esercito sardo that sits on Piazza Castello right in front of Palazzo Madama. 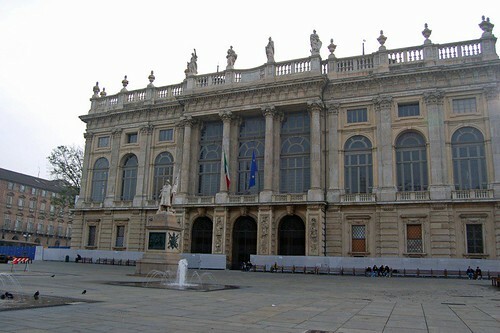 That light coloured structure at the back of this photo is the Palazzo Reale - that Piazzetta Reale sits in front of it. 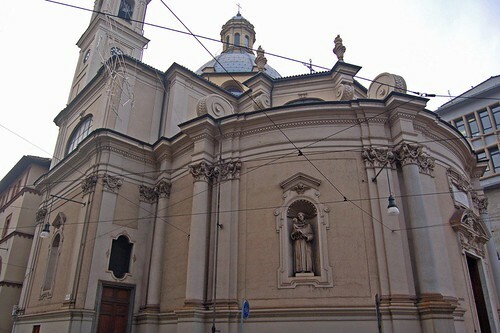 The cupola you can see poking out belongs to the Chiesa di San Lorenzo (Church of San Lorenzo). 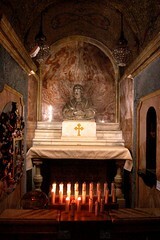 It's here that the Shroud of Turin was first kept when it arrived from Chambéry. 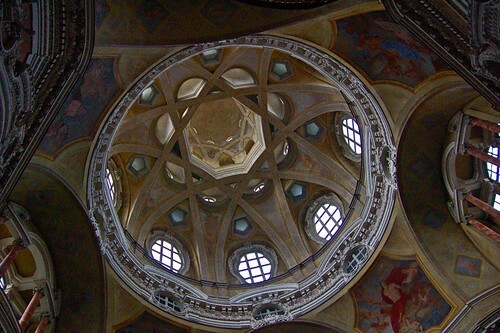 The impressive cupola was designed by Guarini and finished in 1680. As it happens I'm lucky enough to get into a tour of the Palazzo Reale itself - and the Torino Card comes in handy as it gives me free entry. You can't take photos inside so while I wait for the tour to start I take some snaps of the outside. 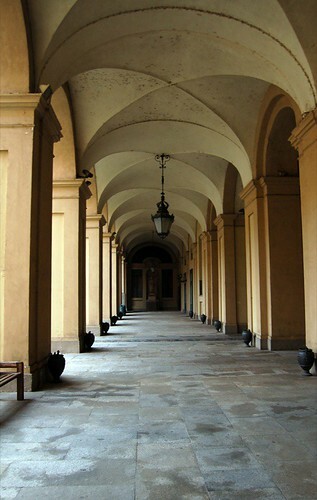 Corridors ring the central courtyard. 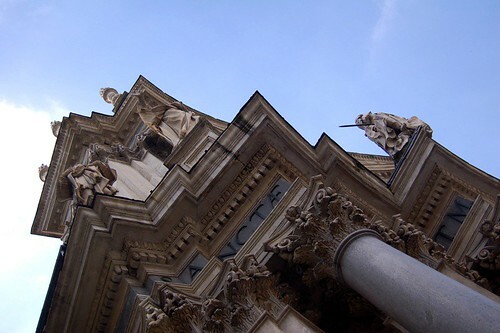 The guided tour runs for an hour (it's in Italian) and just for the sheer beauty of this building I'd go even if I couldn't understand a word. You're lead up the most amazing staircase into the Audience Hall, which I imagine would have been a most formidable experience during the heyday of the palace - it still is unbelievable impressive. Walking up the stairs thoughts fill of all the people that have taken these same steps. Historically, it's fascinating. 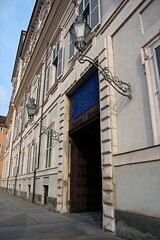 It was the House of Savoy's official Palace until 1865. 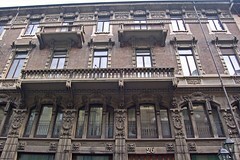 It was built in 1646 on the site of Palazzo Vescovile. The gardens were created by Le Notre who was also responsible for the gardens at Versailles. 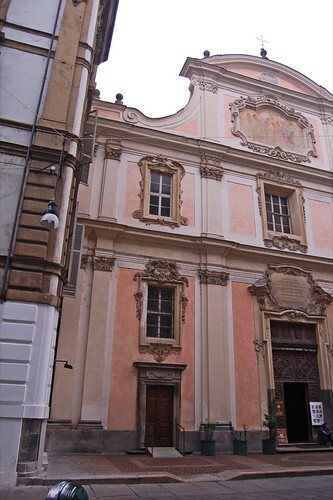 The facade was designed by Castellamonte and built in 1658. 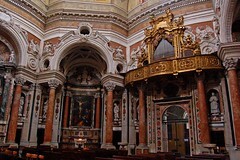 It was damaged during Napoleons time and subsequently restored under Carlo Alberto. 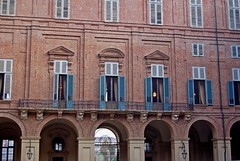 On the tour you'll see the private apartments of the King and Queen Maria Teresa along with the state rooms on the first floor. The inlay floors are particularly beautiful. 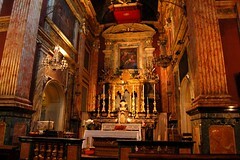 After this brief step back in time I return to the present and head off to another church - the Church of San Lorenzo. 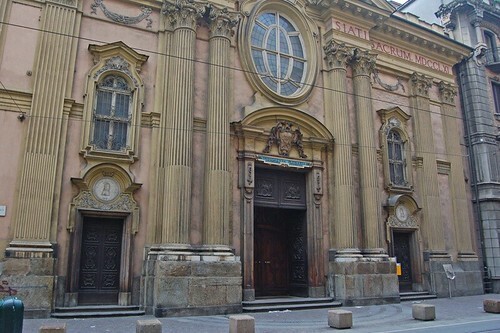 This was originally the royal chapel of the Savoys and these days, it's exterior looks a little tired. 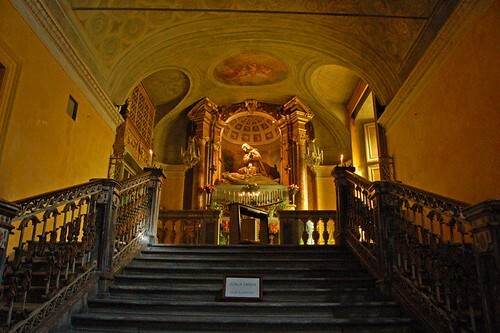 I believe the only way you can climb sacred steps is on your knees. I really didn't expect to see this type of interior based on the state of the externals. 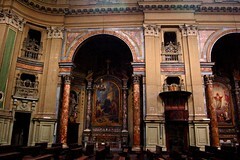 Just a short stroll from here is the current home of the Shroud of Turin - Cattedrale di San Giovanni Battista or Duomo. I didn't get to go inside as there was a most annoying gypsy at the entrance hawking her baby - I'll return when she's not around. 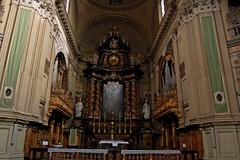 This is the Chiesa di San Filippo Nero - surprisingly it's Turin's largest church - the interior is 69m/226 feet long with a single nave and six side chapels. 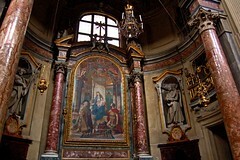 The main altar has a painting of the Virgin Mary and Child by Maratta. 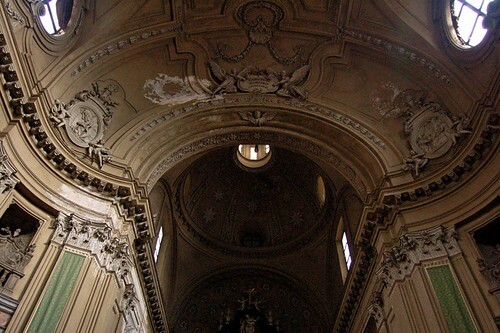 Antonio Bettini's original 1675 design was damaged when the dome collapsed in 1715 and Juvarra was called in to oversee the renovation work. 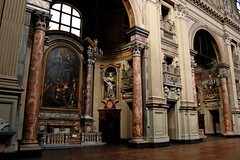 He left after 15 years and the work was passed onto Talucchi who gave it the neo-classical facade. It wouldn't be remiss to say that it probably needs a little work done on the interior as you might be able to tell from this photo. As I left the church I finally found the sign pointing me to the Egyptian Museum - I must have walk past it a dozen times! Looking at the time I decide to have some much needed lunch. I don't go too far - there's a cafe just across the road. 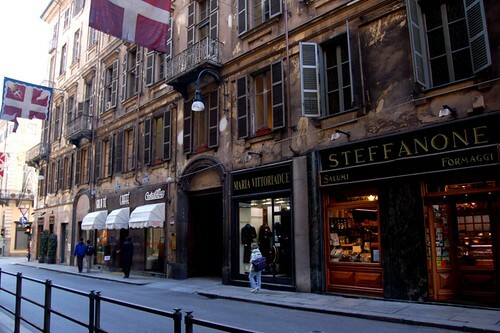 It's actually the place with the white awnings Caffe Le Clou. What a fabulous lunch! 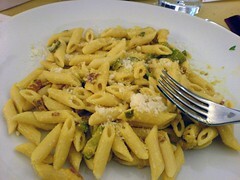 Perfectly cooked pasta with pancetta and zucchini, fresh bread and naturally, olive oil and balsamic vinegar. It's simple but incredibly tasty. Topped off with another caffe late, I'm set! I drop into the Museum but decide to leave it for tomorrow morning - it's just a little too crowded for my liking. 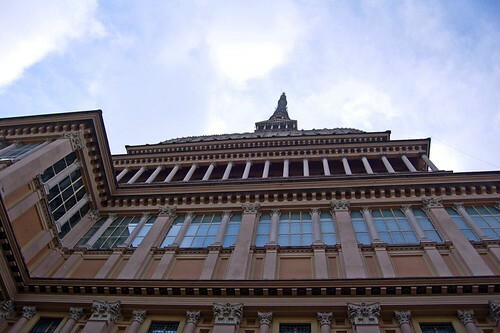 So instead I readjust my highly accurate internal compass and head off to find the Mole Antonelliana. What's that I can hear you asking? 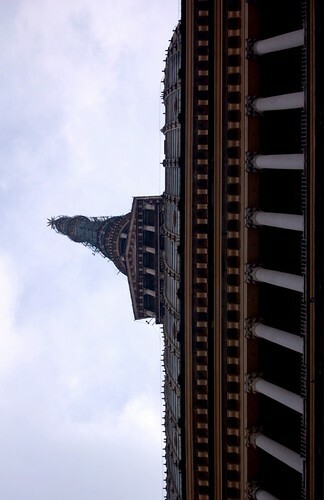 It's the landmark building of Turin - you can see it all over town. You see that antenna thing poking out in the distance - that belongs to the Mole. 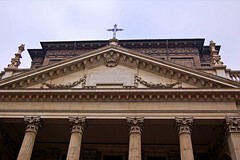 But before I get there - I find another church! 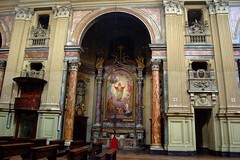 Actually it's twin churches (Le chiese gemelle) - San Carlo & Santa Cristina. 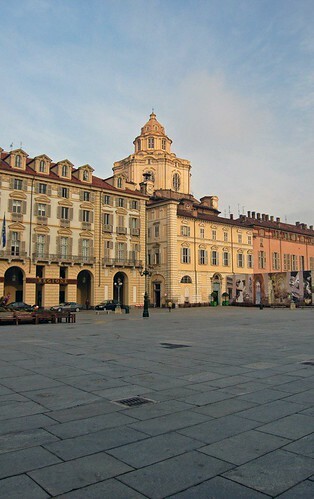 Getting to see both is a real problem as the square on which they sit - Piazza San Carlo is surrounded by fences. Yep, it's another site that is getting ready for the winter Olympics. 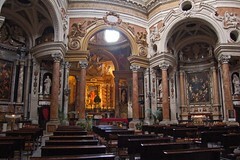 They sit on each side of Via Roma and were built in the 17th Century. 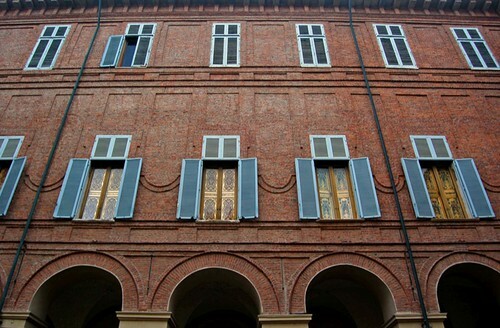 Juvarra designed the concave facade of Santa Cristina. It's on my walk between here and the mole that I get shouted at. I was in the university district and just waiting at the lights for them to change when a hoon comes round the corner and shouts at me through his window, fist waving "turista!" I must say I was a little perplexed. What exactly was his problem and what exactly was I doing that was so horrible? Maybe I wasn't crossing against the lights, maybe that made me a tourist. And so what? 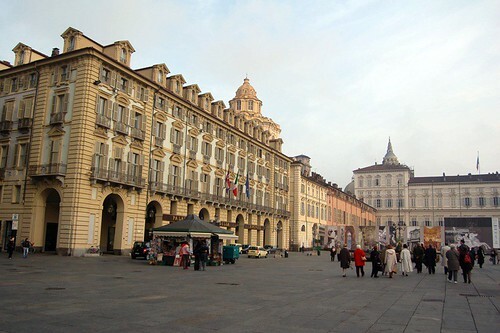 I'm spending money in his city he should be thankful considering the economic hole Turin has been in for the last 30 years. 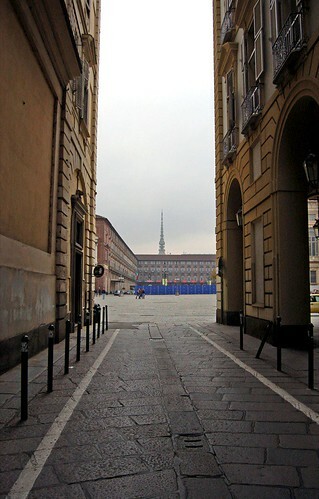 Turin is only now inching it's way back. It kinda makes me realise that university districts are the same regardless of which country you are in - cesspools full of malcontents. I know I'm generalising but the level and nature of graffiti here leads me to form certain opinions on the mental condition of those in the area. 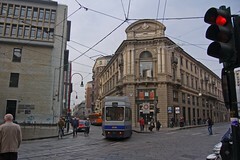 After that little bit of excitement I finally come upon the Mole Antonelliana - it's home to the Museo Nazionale del Cinema (National Museum of Cinema). 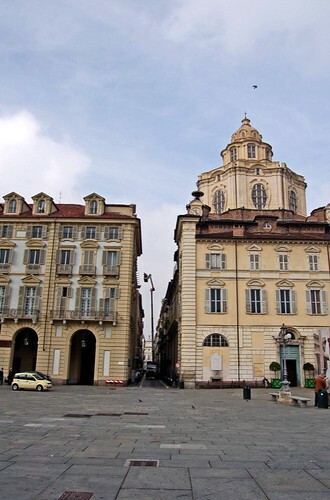 I had been told when I purchased the Torino Card that the elevator that takes you to the top was closed, but as luck would have it, the whole place was closed as well! It too has become victim to the Olympics and is having some work done on the exhibits. Oh well. 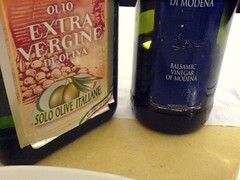 Off I toddle back to the b&b but I decide to stop and treat myself with another visit to Al Bicerin. 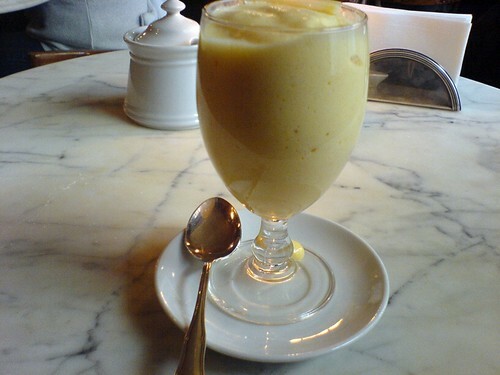 This time I have their famous Zabaglione. This is fun, you can hear them whisking it up fresh in the kitchen and out it arrives all warm and fluffy and highly boozy. Just like mamma made! I make it back to the b&b with a warm glow. Come dinner time I head out again to try another local restaurant. I find an interesting place but it won't be open until 9pm so I decide to do like the locals and find some place for an aperitivo. In one of the many lanes I stumble upon a cute little place that has a aperitivo special of 6 crostini and a drink for €5. I'm the only one in the place and I get chatting with the owner. He's a bit perplexed at how good my Italian is so I explain that my parents are Italian. Besides running the bar with his wife he also a photographer like me and even publishes his own magazine. He shares an older issue that featured Australia and his current issue on Torino and he kindly gives them to me as a souvenir. After a most pleasant time I eventually head off for my late dinner. 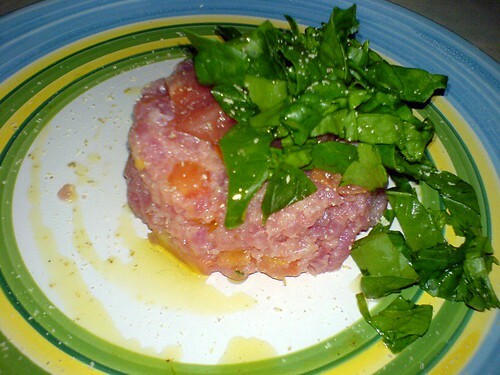 A most generous serve of wonderfully fresh tuna accented by the tangy grapefruit. 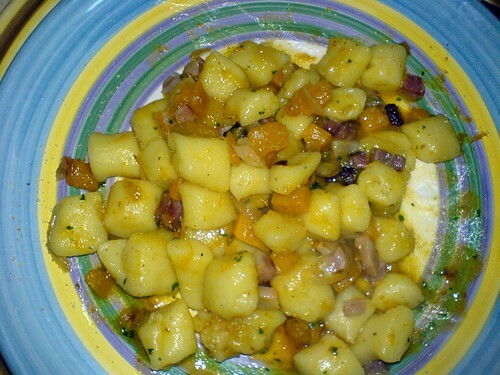 The gnocchi were like potato clouds - so light they just dissolved in your mouth. These have to be the closest I've come to my mother's gnocchi. Feeling totally satisfied, I decide to skip desert, settling on a coffee to finish a fantastic evening.